Just in time for this month's Great Backyard Bird Count, Downtown Bookworks provided me with two books perfect for a bird-inclined young child. (These titles would also be great to introduce a young child to birds and bird-watching.) I field tested both PBS Kids Look and Learn Birds by Sarah Parvis and Science with Stuff: Bird-acious by Melissa Stewart with an eight year old. Science with Stuff: Bird-Acious has 23 short sections starting with the relationship between dinosaurs and birds (birds are dinosaurs). Subsequent chapters discuss anatomy and behavior including bird size feathers and flight, mating and chick rearing, and beaks and tongues and their role in diet. The subject of the third to last section is waste and one of the wastes featured is an owl pellet which is a fantastic segue to the final two sections of the book. The hands-on project included in this book immediately captured my son's attention. He actually completed the project before reading the book. An owl pellet is enclosed in the front cover of the book and the final pages of the book discusses the owl to which the pellet belongs, how to dissect a pellet, and how pellets are formed. In addition, there is a key to identify the individual bones and the type of animal in the pellet. My son first dissected an owl pellet in preK. He's now in second grade. He has dissected additional pellets within this time frame. His specific feedback was that Science with Stuff: Bird-Acious should be packaged with more than one pellet. He also thought several of the images were gross yet fascinating. If you've read this book or if you buy it after reading this review, let me know which images riveted your child! 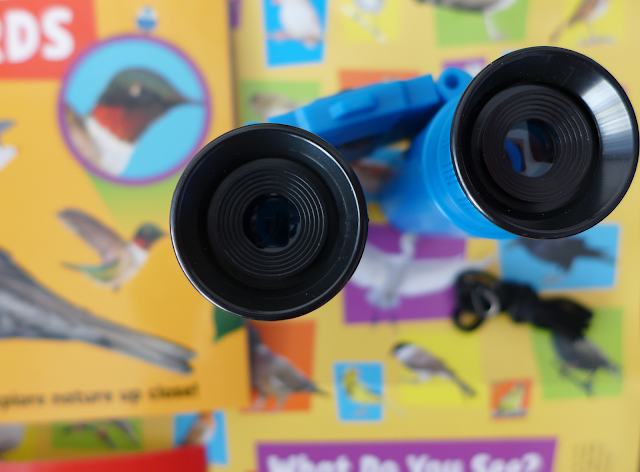 Look and Learn Birds is part of a kit that includes a pair of binoculars, a laminated list of common North American birds, and an activity poster. The page colors and font are lively and appealing to young children. Another stand-out design feature of the book are the photographs which are bright and sharp. The systematic arrangement of the books 23 short sections takes the reader through the process of how to bird watch while teaching the reader about bird anatomy and behavior. The writing is straightforward and accessible to a young reader. Instructions on how to use the binoculars is placed at the end of the book which I appreciated. I think placing the instructions at the beginning would have been distracting. My son said he learned many new things about birds and listed three facts: sparrows don't fall from trees while sleeping because of the architecture of their toes, nuthatches walk down tree trunks, and ravens are larger than crows. He enjoyed looking at the photographs. He would like to see more photographs and more factoids in a future edition of the book! He thinks the kit could be improved with better binoculars. He wanted better distance range. These basic binoculars work fine for stationary, eye-level, close-up birds. I have one peeve about the book. It uses the term "seagulls" in the Shorebirds section. When I mentioned this to my son he told me that one has to use the term sea-gulls otherwise you might think they were bay-gulls. Get it? 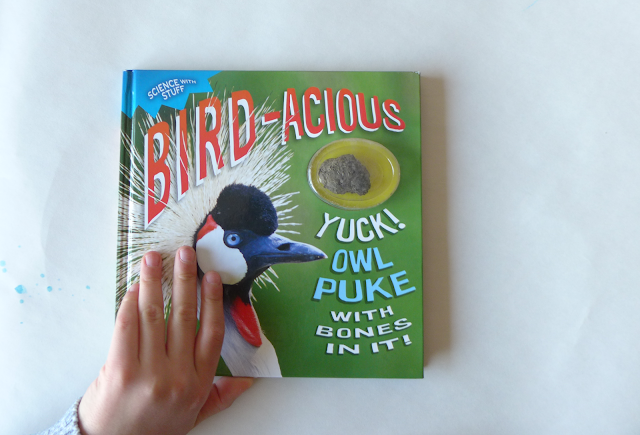 Science with Stuff: Bird-acious and and Look and Learn Birds are packed with great information about bird anatomy and behavior. Our favorite though is Look and Learn Birds for its compelling photographs and easy guide to birding. In the end, they are different books. The former engages you with an exploration of a bird bio-fact (the owl pellet) while the other one provides tools to get you outside looking at birds. Both books are provided for review purposes by Downtown Bookworks. LOVE this!! I want to check these out for my own kids! What a great review and test for other parents. Many thanks, Bryony! A preschooler used the PBS Kids bird card during a GBBC event. Her parent took the product information so she could purchase the kit for her daughter. Another successful field test.